The LED lighted mirror is becoming more popular with new models being released by manufacturers who are constantly evolving or should I say responding to consumer demand. MyHealthandBeauty has a range of LED lighted mirrors that will fit almost any purpose from travelling to a wonderful addition to your new designer bathroom. Our latest shipment features the new Jerdon rectangle wall mount LED lighted mirror and the double sided 8x wall mount LED lighted mirror. 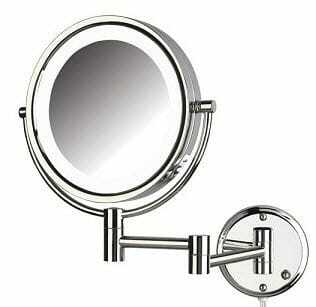 Both are excellent high quality mirrors stand out from the current crop of no name offerings flooding the market place. These magnifying mirrors were specially built for Australia 240 volt power and have been through SAA and Ctick testing to be certified to sell in Australia. The mirror uses LED globes rated at super long lasting and use very little power. Jerdon have worked extensively to have the LED color become more sympathetic with your complexion. In previous posts many of the LED mirrors available give off a harsh white light and does not show your complexion in the most natural look. It then becomes very easy to apply makeup that’s does not work for you at all. Jerdon’s HL7 halo series which uses incandescent lighting has been so popular which will show your complexion in the most natural look. The LED88C has been a longtime coming and 8x magnification works perfectly for those who may wear glasses during the day but need to take them off to apply makeup, remove contact lenses or attend to any eyelid or eyebrow issue. Being double side with the LED halo lighting on both sides it’s becomes easy to attend the close up work and turn the mirror over for and overall view. No matter how dim the environment, or even if you have a well-lit bathroom LED halo lighting is powerful enough to illuminate your face without being harsh on your eyes. And because of the energy-saving LED technology consumes 70% less energy than regular bulbs it costs next to nothing to operate. Currently both mirrors are available as plug in so just mount it on your wall – everything is provided then plug in to your nearby power point and enjoy. For those wanting the direct wired models they will be under way to us shortly. At the start of this post I did say we have a great range of LED Lighted mirrors just click this link as we have much more to offer for you to select your favorite LED lighted mirror. My Next update will be about the top selling makeup mirror in the US and whats more its coming to us early next year.